6h30 – 7h30: The tour begins with a bus or taxi transfer to bus office where you will catch the bus to Sapa. 12h30-13h00: You will arrive Sapa town. Tourguide would pick up you there. Coming to hotel, rest for a short spell to take bath. You have any time to prepare your baggage for your trek. Then you have luch in your hotel. You should bring a little clothing, a comfortable shoes to trek. 14h00: You will begin yours 12 km trek on small trails down the Muong Hoa Valley toward the Black H’mong village of Lao Chai. 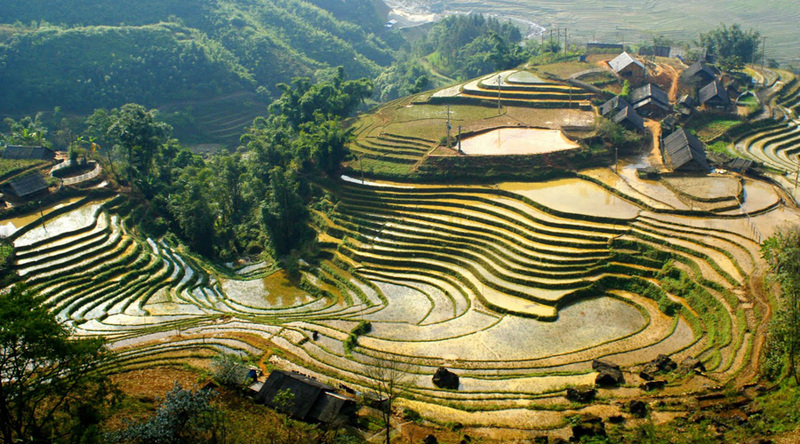 The Muong Hoa Valley contains some of the most beautiful views of terraced fields in Asia. Continuing along the bottom of the Valley to go the Dzay tribe village of Ta Van to experience their way of life when you stay in a local family’s cottage. Please contact us for price quote.